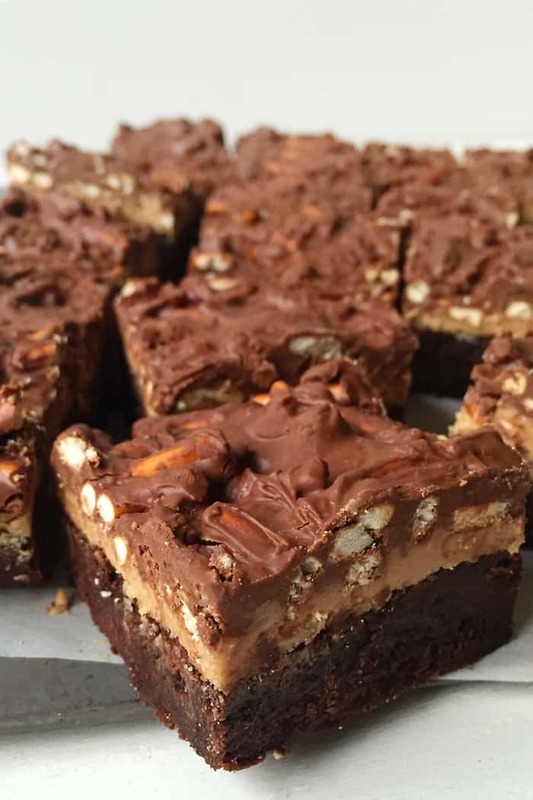 These tri-layer Chocolate Peanut Butter Pretzel Brownies are a decadent dessert for parties! There is, like, one fundamental rule in life and it’s that brownies are for sharing. 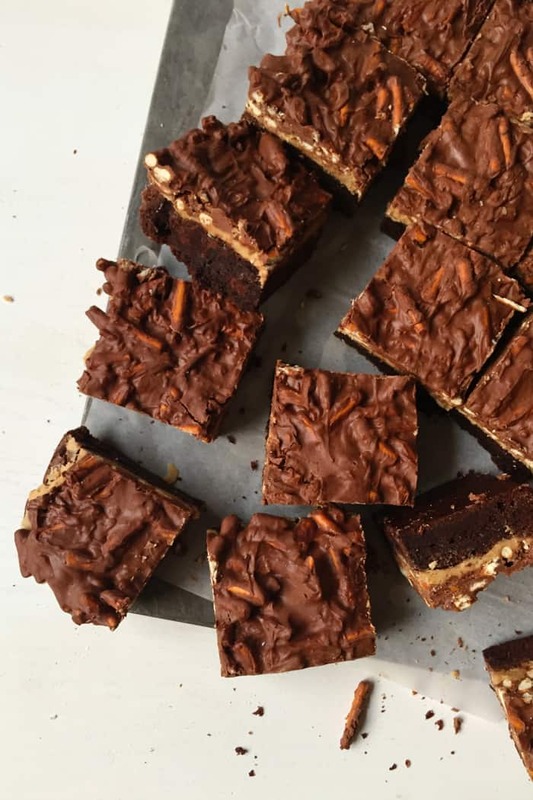 Well, these Chocolate Peanut Butter Pretzel Brownies are for devouring all by yourself. I give you permission. 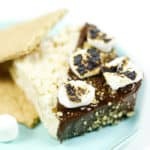 They’re intense, but if you love chocolate and peanut butter, then you’ll love this three-layer dessert. 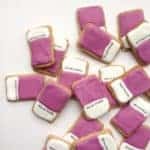 However, if you are magnanimous, giving person who likes to share, then you absolutely must make these for your next party. 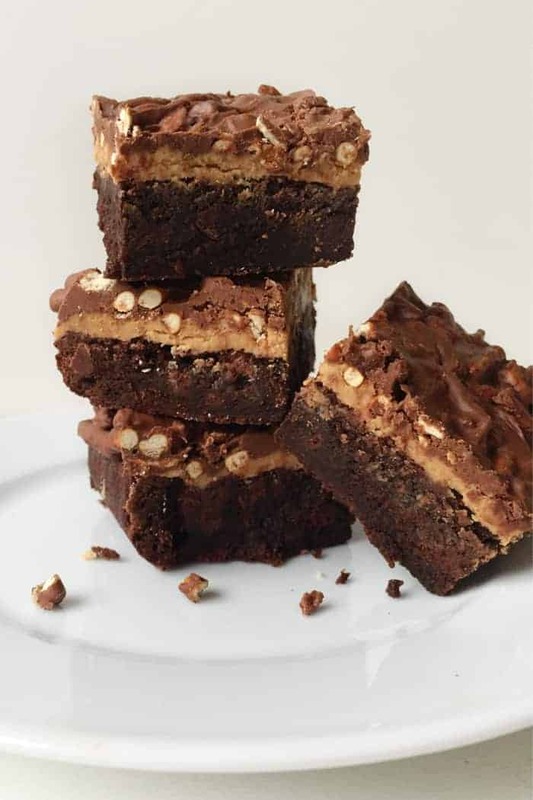 These Chocolate Peanut Butter Pretzel Brownies have everything. 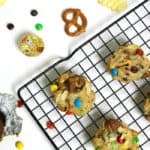 They are succulent fudgy brownies topped with a layer of creamy peanut butter frosting and a layer of milk chocolate-covered crunchy, salty pretzels. In a bite, you’ve got crunch, smooth and chewy. Dense and rich and everything a peanut-butter lover’s brownie should be. My friend Joanne of Fifteen Spatulas recently welcomed her baby boy James! A group of her food blogger friends are throwing a virtual birthday party with her, so I whipped up these brownies. Here are all the recipes in Joanne’s virtual baby shower! These ideas are so fun if you are planning a baby shower or gathering. Preheat oven to 350°F. Lightly grease a 9″ x 13″ pan. In the bowl of a stand mixer, beat eggs at medium speed with the cocoa, salt, baking powder, coffee and vanilla for 4 minutes. Meanwhile, melt the butter. Slowly add the butter and sugar mixture to the egg mixture, stirring until smooth. Then add the flour and chocolate chips, stirring until fully combined. Transfer the batter to the prepared pan. Bake for 30 minutes or until a toothpick or cake tester inserted into the center comes out clean. Remove from the oven and allow to cool completely. Make the peanut butter frosting. In a microwave safe bowl, heat peanut butter and butter in the microwave in 20-second intervals until smooth. Stir in powdered sugar and vanilla until combined. Spread the frosting evenly over the brownies. Put the pretzels in a plastic bag. Beat with a wooden spoon or potato masher until broken into 1-inch pieces. As best you can, separate the larger pieces from the crumbs. In a microwave safe bowl, heat chocolate chips in the microwave in 20-second intervals until melted smooth, stirring in between. Stir in the pretzels. Spread the topping evenly over the brownies. Place the brownies in the fridge for 30 minutes to allow the layers to firm up. Once firm, cut into 4-inch squares. Serve! 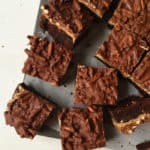 These brownies, with a touch of coffee + PB, are right up my alley. LOVE! Thanks for joining in on the baby celebration for Joanne! Thank you, Brenda! I just wish we could all enjoy them together! 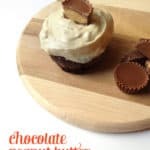 I love peanut butter and chocolate together!! So does Joanne! 🙂 These are so lovely, Susannah! Thank you so much for joining in on the baby shower! These are EPIC brownies, Susannah!! Oh thank you so much, Kathy! I appreciate you stopping by! I can’t wait to try these brownies! I love the salty & sweet flavor combo! I mean, I SUPPOSE you could share these but I would rather hoard the whole pane to myself –jk (or am I ;). These are BEAUTIFUL and I love the sweet and salty combo! Oh wow these brownies look good. Definitely trying and maybe sharing with others at my house. 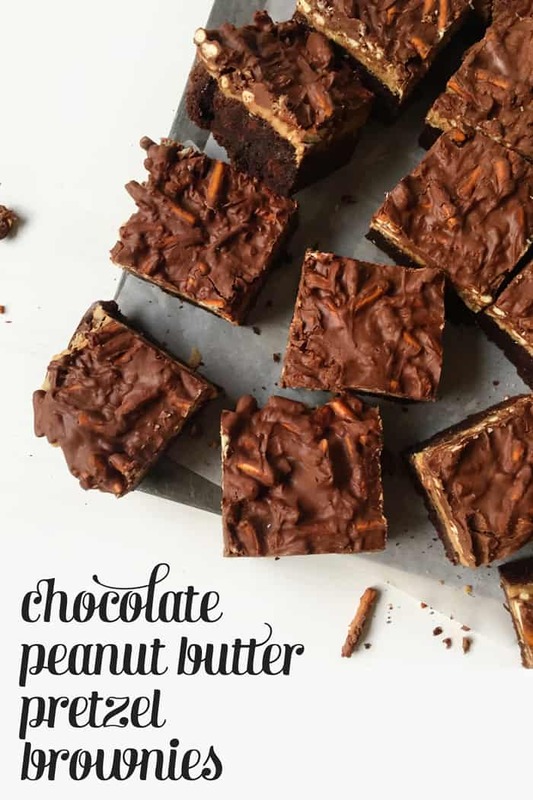 Do you add the peanut butter frosting and the chocolate pretzels to the brownies while they are hot? Or are we to wait until they have cooled? 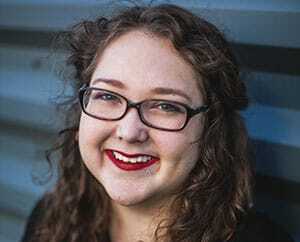 Hey Libby! Great question. I’d recommend letting the brownies cool completely before adding the frosting, otherwise the heat will melt it. Hope you enjoy!